The Superlight range of Fly Vests offers all the features of top quality vests, but at a fraction of the price. 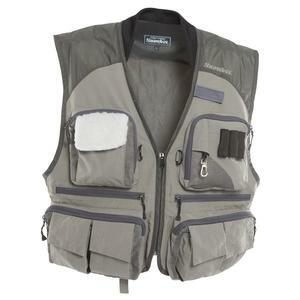 Made from 100% Nylon Taslon material, these vests are so light you won't know you are wearing them! And best of all the Taslon material is 100% waterproof, so if you do get caught out in a shower, it will help keep the pocket contents dry. Very good all round. It is indeed super light. Perfect for those warm days. I've had this vest for a year and found it to be great. However, it has now started to come apart at the seams, with one of the zips falling off. Looking closely at the stitching it appears that the stitching has not been finished off, just cut at the end. I've just spent some time sowing up by hand the ends of the seams in the hope of preventing this.